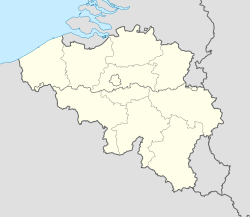 Kaprijke (Dutch pronunciation: [ˈkɑprɛi̯kə]) is a municipality located in the Belgian province of East Flanders. The municipality comprises the towns of Kaprijke proper and Lembeke. On January 1, 2006, Kaprijke had a total population of 6,128. The total area is 33.71 km² which gives a population density of 182 inhabitants per km². The name Kaprijke comes from Gallo-Roman name "Capricum" which means "Land of Caprius". It used to be the site of a Roman garrison can still be seen at the square in front of the old town hall. During the 14th and 15th century, the cloth industry flourished in Kaprijke. However, during the period of religious strife during the 16th century, the merchants and cloth makers withdrew to safer locations. Following the resolution of the problems, the merchants and weavers did not return, leading up to the decline of the city of Kaprijke into a rural village during the 17th and 18th centuries. Kaprijke is known for its beautiful castle built in 1550, Hof ter Kruisen. It was commissioned by Andries of Baviere and finished in 1628. In 1976, Kaprijke merged with another town called Lembeke, for a total population of around 6200 people. Lembeke is the home of Lotus Bakeries. Hippoliet Van Peene (1811–1864), poet and playwright, best known for writing the poem "De Vlaamse Leeuw" which came to be the Flemish anthem. This page was last edited on 7 April 2019, at 23:49 (UTC).